Had I lost my mind? Had I slipped on fabric scraps, fell into the Black Hole of Projects? What on *earth* was I thinking when I actually signed up for a class????? Yes, it's true, I succumbed to the irresistible lure of a drop dead gorgeous quilt, taught by the author of the book, no less. The quilt is on the cover of the above-mentioned book and is a series of 6-sided lozenges radiating out from a central cross. I couldn't resist it, so I didn't. :-) (I am saving my strength for other battles of the will). The author, Gai Perry, used in live in Walnut Creek (omg .. who knew??) but moved about 5 years ago to Davis, CA .. about 45 minutes northeast of Walnut Creek. The local quilt store is the Pincushion Boutique, which is where the class was held. Using a technique that I either figured out for myself (or more likely, heard at some point in time), I culled a focal fabric from my stash and used the colors in it to help me pick out coordinating blenders. Why go thru the nosebleed of color theory yourself when the experts have already done it for you? :-) Besides, my color selection process is long, tortuous and not always completely satisfactory. 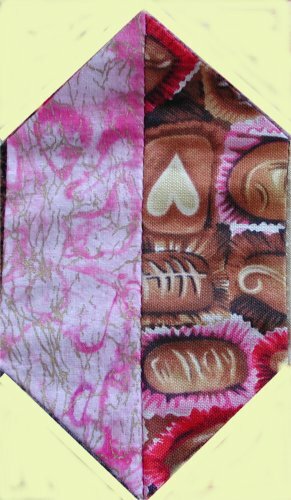 :-) The focal fabric shows lots of little chocolates in shades of pink, cream, brown and tan. Although pink is not my all-time favorite color, I was quite surprised to find I had quite a selection in my stash. How *did* they get there? 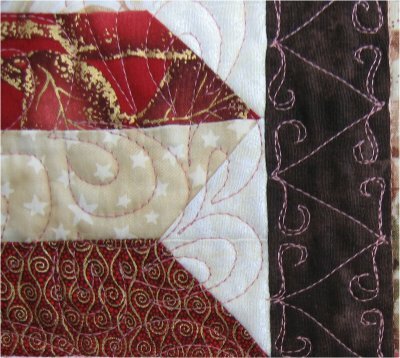 Because the focal fabric features chocolates, I call this quilt, "Liquor is Quicker .... but candy is still dandy!" Once the class was over, I finished the top and packed it away. I needed to return to other more pressing deadline-specific projects! Flash forward to March 2006. I was on a roll to get some of my many tops quilted. This one also got delivered to Janna Bailey of the Quilting Company. 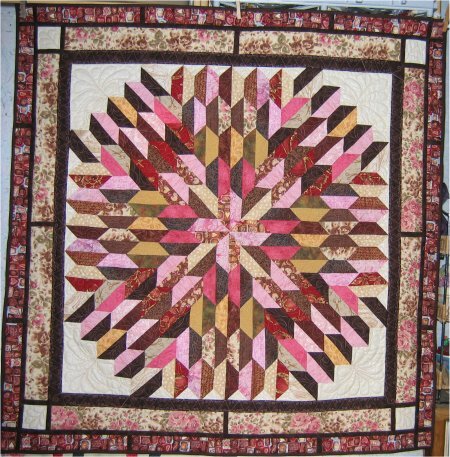 She put feather motifs in the corner triangles, a decorative all-over scroll design in the center medallion, and a delightfully original motif in the brown sashing and more feather scrolls in the outer borders.